We’ve all been there: that moment when we’ve carved out our precious time to make, experience or support art, and instead, we just feel stuck, insecure, or exhausted. All we feel is stress, or pressure, or the immensity of our to-do lists. We may find ourselves wondering why we’re even committed to the making and sharing of creative work, and why we even got into this in the first place. Rituals for Creative Blocks, an EAP MADE project awardee, offered somatic instructions to solve these blocks of contemporary creative life and presented these instructions in a ritualized, playful and even magical banquet setting. On October 22, we held three sessions of our Rituals -- generously hosted by the brand-new second branch of Oakland’s EM Wolfman Books -- in which cultural workers from across the Bay Area were welcomed into a cozy courtyard with a ritual hand-washing, and seated around a curated table designed by chef-artist Kim Upstill. We began each session with a short introduction to the project, and a context of the curator’s work together. To open the banquet and begin to involve participant’s voices, we then went on to each participant introducing themselves and reading aloud their individual creative block--which they’d submitted in order to reserve a seat and was conveniently provided as a placement for their seat. As participants read aloud their block, we taught the group to respond “problem,” in chorus, evoking both the call-and-response of religious ceremony and the structured support of a 12 step program. We also made space for participants to share responses to each person’s block, often resulting in a feeling of deep affinity and shared experience. Once each block was read aloud, we began delivering the rituals. One at a time, a participant would summarize their block, then have their ritual read aloud to them by one of the curators. Rituals always included some kind of somatic instruction but varied in their context from things the participant would be required to build, to specific ways the participant should wait or interact with others around them. As the ritual completed, Upstill handed them an individualized snack, prepared particularly for their block, and the participant seated next to them sprayed them with orange-scented oil as they imbibed their snack. Once they were done with the individual snack, they described to the group how the snack tasted and how it made them feel, in order to fully complete the link of the emotional, intellectual and somatic experience at hand. As others had their rituals read to them, participants listened intently, snacked on the curated table, laughed, and even teared up. One by one, each participant was gifted their ritual, individual snack, and face spray, and as we concluded Upstill poured a barley tea into the ceramic shot glasses she’d handmade for each participant for the event. We toasted as a group and concluded the event, and participants lingered for a while after, sharing with one another about the ways they related to each block, and signing up to receive the forthcoming publication of all of the rituals. As one participant stated, I feel so supported and more moved than I ever expected. Though presented in a supportive, warm environment, the rituals were a combination of humor, sarcasm, tenderness, and challenges, and asked participants to examine indirect and creative solutions to everyday problems that can appear intractable and deeply entrenched. It was interesting to feel like I was being healed and laughing at the same time, said another. With their sense of magic and levity, the rituals allowed participants breathing room around common long-held insecurities and blocks including imposter syndrome, lack of financial compensation, and the hustle of over-committed busy lives. We look forward to sharing the compilation of rituals and images from the events in our forthcoming chapbook, made possible by funding from EAP. Funding also supported the creative labor of the curators and chef artist, the design and purchasing of food and drink for the event, a photographer to capture the events in order for their magic to be shared with a larger audience, and custom-designed paper products for the events themselves. The nourishing, life-affirming experience of being so well fed (aesthetically, emotionally and literally) would not have been possible for us to provide to our participants without the generous support of EAP. In our ten+ years as curators, artists, arts administrators and educators who juggle so many roles, we know well the sense of exhaustion and defeat that is the risk of a committed creative life. With these rituals we remember that art is not something made from life -- it is life, and that both art and life are best nourished when addressed as one. These Rituals teach us that even when we face some of life’s most common challenges -- from emotional and financial insecurity to the stresses of parenting and family life -- we have the opportunity to remember magic, humor, and embodiment, and we have the opportunity to turn our creative capacities towards these challenges themselves. While we had held small Rituals dinners prior to these events in private living rooms and galleries, we applied for Emerging Arts Professionals’ (EAP) MADE program in order to have the opportunity to share the Rituals with a larger audience and beyond our immediate social networks. 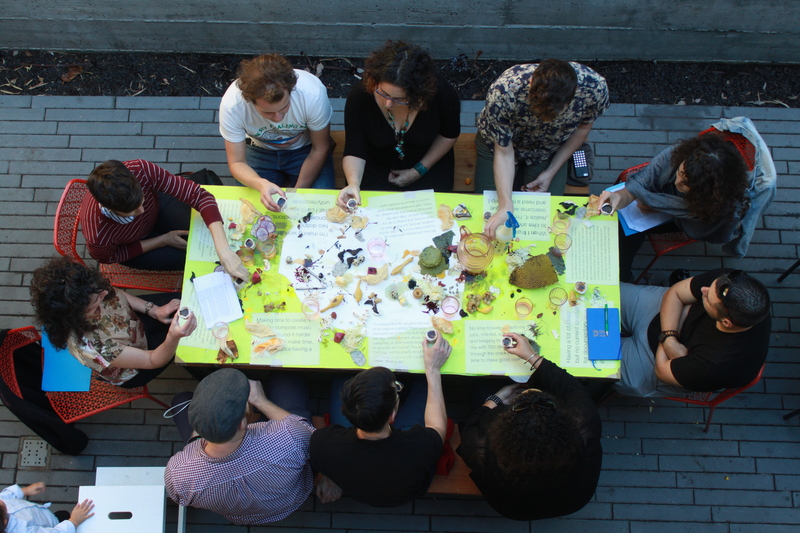 Our goal for this iteration of “Rituals for Removing Creative Blocks” was to provide a nourishing, connective and transformative space for cultural workers, emerging arts administrators, artists, and allies to be enlivened, fed and refreshed without having to leave their personal lives and contexts at the door. We all find ourselves in moments of stuckness and burnout, but we hope that the Emerging Arts Professionals’ continued dedication to creative and thoughtful artist-led events like this one can infuse the days of cultural workers with the essential experiences of play, experimentation, and even liberation. Leora Fridman is a writer, artist and educator, author of My Fault (Cleveland State University Press, 2016) in addition to multiple chapbooks of poetry, prose and translations, and is currently at work on a book of nonfiction.